A raging wildfire east of Los Angeles has grown to 18,000 acres, forcing more than 82,000 people to evacuate, fire officials said Tuesday night. Interested in Blue Cut Fire? 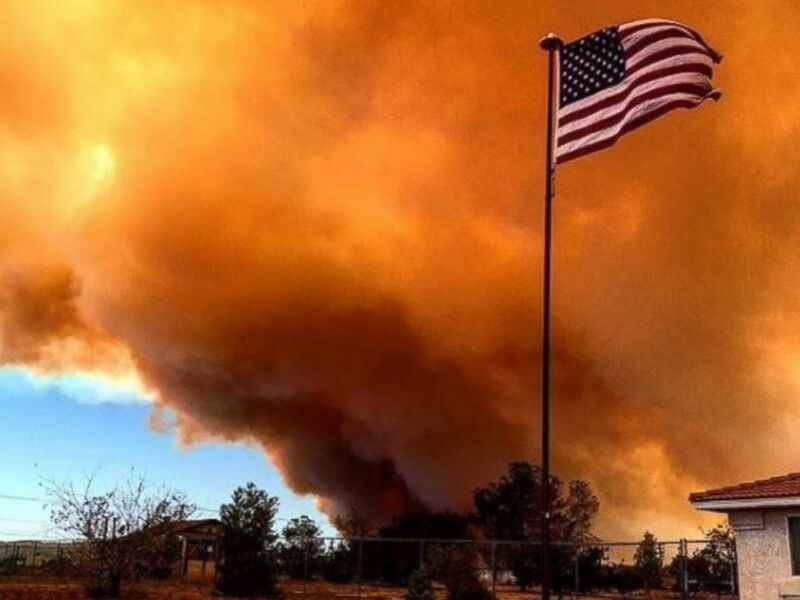 Add Blue Cut Fire as an interest to stay up to date on the latest Blue Cut Fire news, video, and analysis from ABC News. And despite intense efforts to put out the Blue Cut fire -- named because it started near a trail called Blue Cut -- it remains 0 percent contained, Cal Fire officials said. Gov. Jerry Brown declared a state of emergency Tuesday in the wake of the inferno breaking out. Nearly 35,000 homes were evacuated and two firefighters treated for smoke inhalation. Officials said least a dozen buildings have been burned, including homes and an historic diner called the Summit Inn. The Blue Cut Fire rages on in San Bernardino County, California, on August 16, 2016. 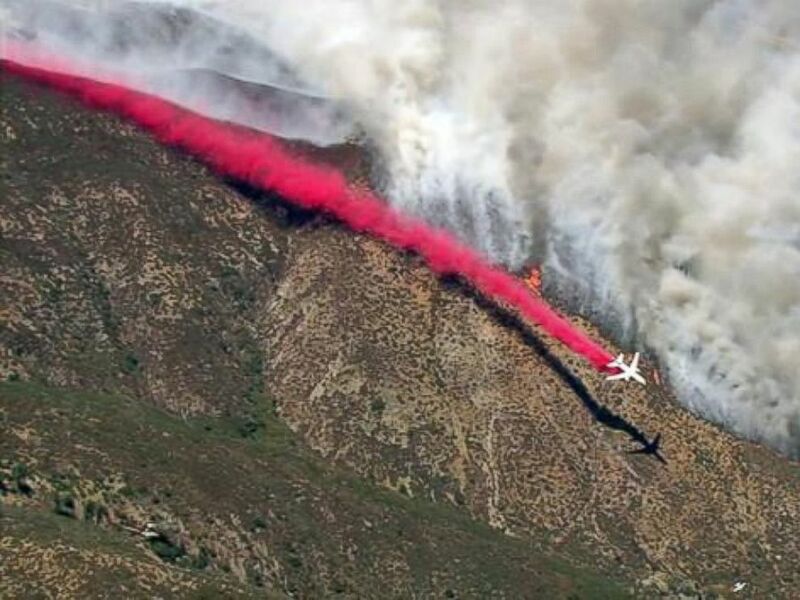 A plane drops fire retardant while battling the Blue Cut Fire in the San Bernardino National Forest on Tuesday, Aug. 16, 2016. 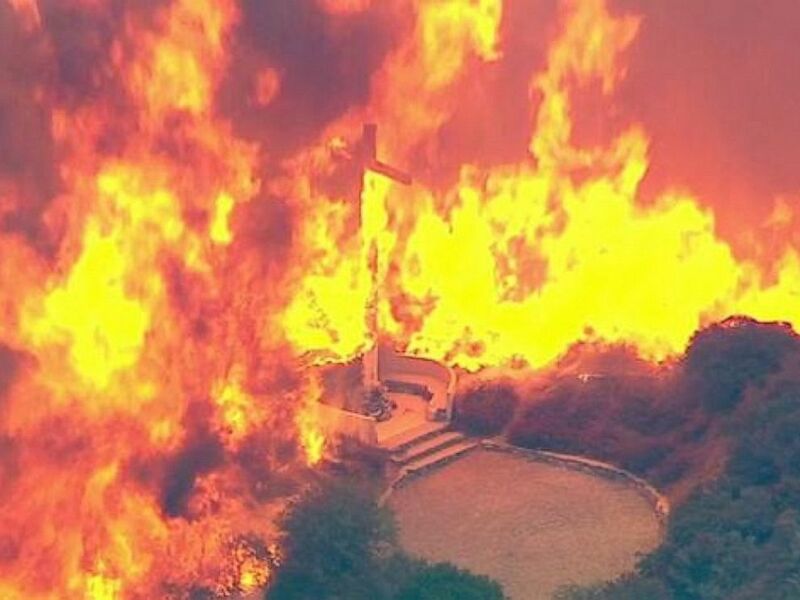 A fire rages in San Bernardino, California, on August 16, 2016. The fire is shooting flames 80 to 100 feet high. It has closed Interstate 15, the main route between Los Angeles and Las Vegas, leaving people stranded for hours. A cross burns in the Blue Cut Fire in the San Bernardino National Forest above Devore on Tuesday, Aug. 16, 2016. Eric Sherwin of the San Bernardino County Fire Department told the AP the blaze began in the Cajon Pass and continues to race in several directions. 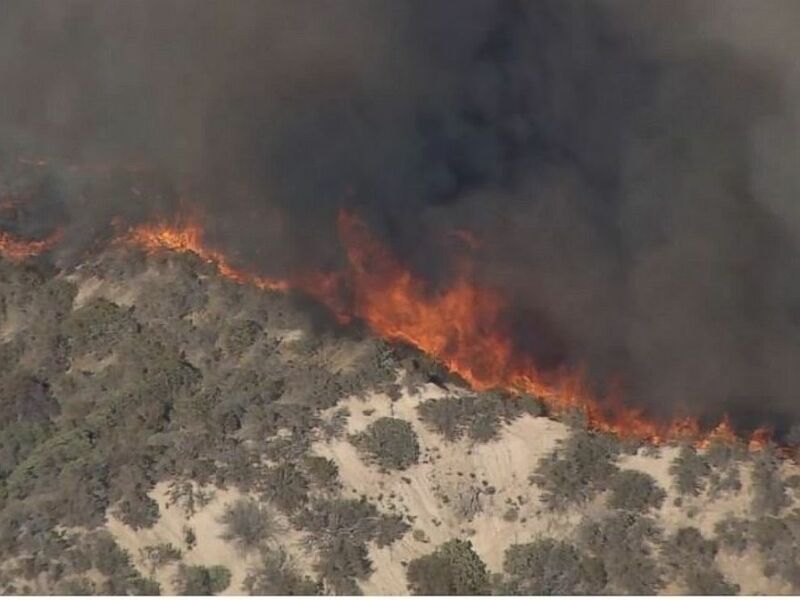 It has topped ridges in the San Bernardino Mountains and is closing in on high desert communities on the other side.